It was all a staged bit, of course, but one that illustrates that the calls for game developers to unionise are getting louder, and reaching the eyes and ears of its biggest names. The gaming industry’s most visible pro-union organisation, Game Workers Unite, is out in force at this year’s GDC, handing out zines and even running multiple conference sessions. With the inescapable shadow of layoffs looming heavier than ever and crunch culture chewing up developers and spitting them out, more and more developers have embraced the idea of unionisation. After just one year, GWU has chapters in cities across the world. That said, no triple-A video game companies have unionized yet. 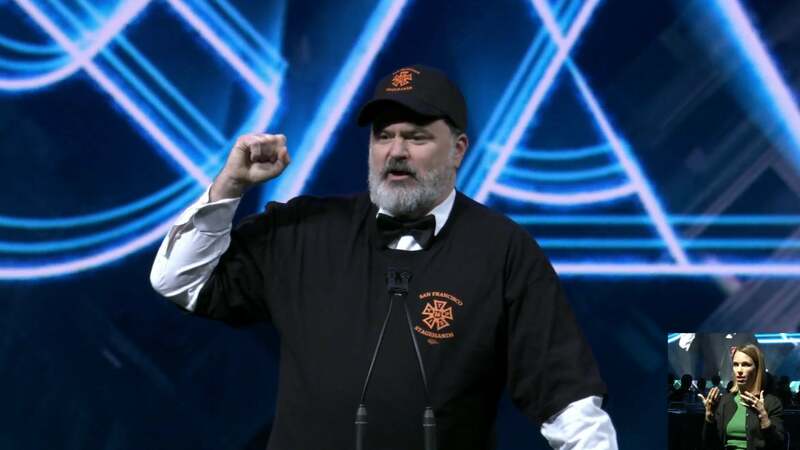 The lights-out bit was neither the first nor the last reference to unionisation At the end of the show, after the developers of God of War had taken the stage to accept the award for game of the year, Schafer returned to the stage, his suit covered over with a T-shirt baseball cap emblazoned with the logo of the union whose workers were putting on the GDC Awards show, the International Alliance of Theatrical Stage Employees Local 16. In his closing remarks, he also thanked Local 16 by name. Earlier in the night, Independent Games Festival awards host and narrative designer Meg Jayanth, sporting a pin that read “UNION NOW,” made a more straightforward appeal in favour of unionisation. Other developers also used their time on stage to quietly show support for the idea of unionisation. At the end of the IGF show, the Seamus McNally Grand Prize was presented by Night in the Woods developers Alec Holowka and Scott Benson, the latter of whom wore a “UNION NOW” pin and recently founded a worker-owned cooperative alongside fellow designer Bethany Hockenberry to produce their next game. Reactions to these pro-union sentiments were largely positive, though some questioned the validity of Schafer’s skit in particular, given that he’s the head of a non-unionised studio. Many also pointed out the irony of Rockstar taking home the “best technology” award that night, sans any mention of the sometimes-gruelling work culture that made the company a poster child for problematic crunch last year. Earlier today, video game union organisers Game Workers Unite offered to lend Schafer a hand. Yeah Union! So we'll force publishers to charge more for games, hurting consumers. See... the funny thing here is the assumption that publishers are "forced" to increase base price or "need" to make micro transactions/lootboxes/games as a service are all "forced"..
Yup... they would tooootaaaallly make it reasonably priced if they could.. but yeah making excessive profit is somethimg forced on them! The poor sods! So you'd rather theoretically cheaper games than a group of people have increased job security and workplace rights? im starting to think this is a troll account. I doubt it. She has said she is American and does not like the US Kotaku community (which I can understand). I think she is just an example of your average Fox news viewer. Why do you feel the need to try and divide people? you can dislike one poster without then trying to tarnish a whole swath of other people no involved in this discussion. It is ok for people to have varying opinions and beliefs, we don't need to hate on people because of it. I don't dislike her as a person. without then trying to tarnish a whole swath of other people no involved in this discussion. Have you seen the crap Faux news shits out of its screens? Damn straight. First it's unions, next these Americans will want universal healthcare. Then it's a full blow communist dictatorship! People should be thankful they can't afford healthcare and have to live on foodstamps because of unlivable wages! Do you actually live on food stamps and have an 'unlivable' wage? My only concern is that if unionization happens its done right and not mandatory to join it if you wish to work in the industry. As when unions are done right the industry as a whole benefits, if done badly they become self serving and ultimately only the union leaders benefit at the expense of its members.